A distinguishing feature of the Maritime Law LL.M. 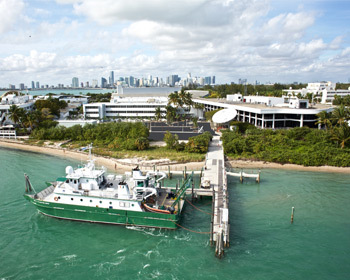 program is the access students have to the expertise of the University of Miami’s Rosenstiel School of Marine and Atmospheric Science – a world-leader in oceanic and atmospheric research and teaching. 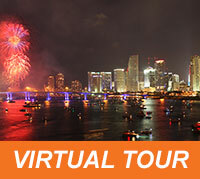 - The only coral reef ecosystem in the U.S. The Marine Technology Life Sciences Seawater Complex at RSMAS is comprised of two connected buildings - one focuses on hurricane science and the other on marine research. 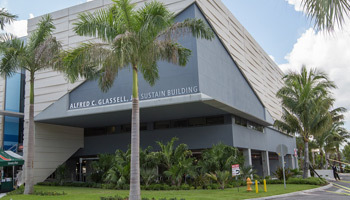 The Alfred C. Glassell, Jr. SUSTAIN Building (SUrge-STructure-Atmosphere INteraction) houses the world’s largest hurricane simulator. 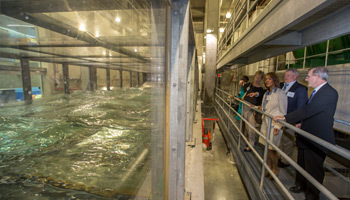 This hurricane simulator is a wind and wave machine that resembles a giant tank, without the fish, and helps better understand the physics of storm strength, and how the warmth of the ocean powers a hurricane and causes damage to homes and buildings. Attached by a walkway, the Marine Life Sciences Center houses laboratories for study of marine animals, the connections between oceans and human health, and the impacts of climate change. 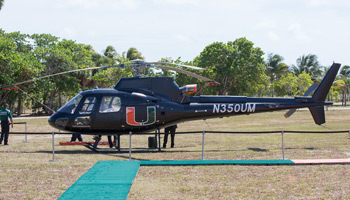 The Rosenstiel School also owns a helicopter that is a one-of-a-kind flying scientific laboratory. The aircraft enables collection of information on marine life, the Earth’s surface, along with the thin atmospheric layer above it, allowing students to obtain vital information about climate and human health. This UM ship, also at The Rosenstiel School, can cruise on shallow waters enabling exploration of reefs, mangroves, grassbeds, and other shallow environments. The F.G. Walton Smith vessel can hold 20 people, has ten staterooms and encompasses 800 square feet of laboratory space and 800 square feet of multi-use space. 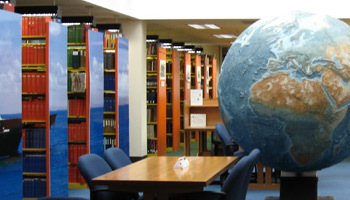 One of the foremost marine science libraries in the United States, the Rosenstiel School of Marine and Atmospheric Science Library holds more than 85,000 volumes, including over 300 atlases and 1,500 maps and nautical charts. It also includes a large Caribbean and Latin American collection, a museum with one of the world's most extensive collections – 400,000 specimens - of invertebrate tropical marine life. 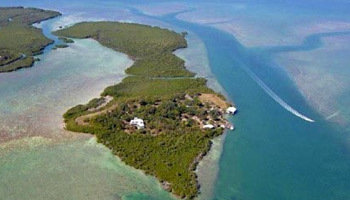 The School also operates a 78-acre advanced satellite reception and analysis center - Broad Key Research Station - in southern Miami-Dade County off the coast of Key Largo, FL, providing direct access to conduct marine research in the sub-tropical Florida Keys. Here students use low earth-orbiting satellite systems to access direct data for environmental monitoring of the Gulf of Mexico, Southeastern United States, northern South America, Central America and the Caribbean Basin. 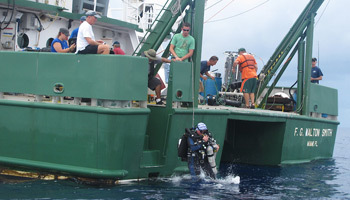 The UM Dive Office and Scientific Diving Program supports students doing research in Conservation, Marine Affairs, Archaeology, Biology, Chemistry, and Geology. Project locations include local reefs, Florida Keys, Dry Tortugas, Little Salt Spring (West-Central Florida), U.S. Virgin Islands, Cayman Islands, Galapagos, Dominican Republic, French Polynesia, Panama, and Australia. 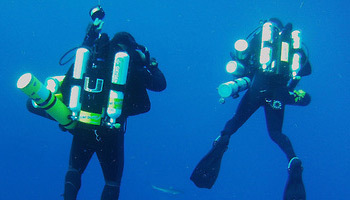 This office offers diving techniques (Nitrox, trimix, double tanks, staged decompression, surface supplied diving, diver propulsion vehicles, and closed-circuit rebreathers) and the latest techniques, technologies, support and training while maintaining the highest standards of safety.